Everybody enjoys a BBQ or a cookout. Summertime entertaining is a great time to get together with family and friends enjoy great weather, outdoor entertaining, great company and great food. 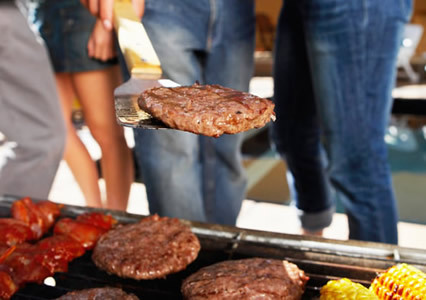 Part of the fun of a BBQ or cook out for our family and friends is sharing homemade dishes. We're going to be sharing some of these flavorful and easy bbq recipes with you so your family can enjoy them too. The best part about these recipes is that they are simple. You won't have to be slaving over the stove while others are outside enjoying the weather. Looking for new barbecue menu ideas? Try our flavorful vegetable side dishes. One of our newest ones is from Food and Wine Magazine, it's a Crisp Tomato, Zucchini & Eggplant Bread Gratin. It's a perfect make-ahead dish. Enjoy the flavors of the Caribbean, India, Morocco and Asia tonight by simply marinating your meat, poultry, seafood, pork or vegetables before grilling! Try our newest bbq beef marinade that helps to tenderize too! Try our ideas for grilling potatoes! It's super easy! Does your grilled steak look as good as this one? It can. It took us a while to find a fool proof time table for cooking steaks, but we did. We've used this time table for years now, with every cut of steak we've cooked and they've turned out perfectly. I once had a guest comment he couldn't believe he asked for a medium-rare steak and his wife asked for a medium steak and they were served that way. It seems that at a lot of backyard barbecues the steaks are cooked all one way - overdone. Believe me when I say you can cook the perfect steak every time using this time table. Visit our page with a grill timetable for grilling and broiling steaks. 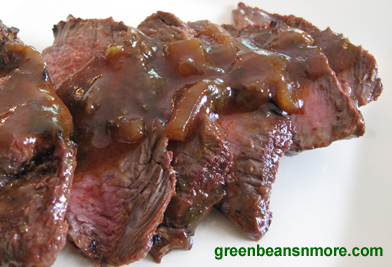 Once you've grilled the perfect steak enjoy it with homemade original Henry Bain steak sauce. Try our Green Beans a`la Waterman's for your next cookout! It's the perfect no-fuss vegetable side dish. You can keep it on your stove on a low simmer and your guests are sure to love it! It's a perfect side dish for our Maryland Jumbo Lump Crab Cakes. The Perfect Potato for Potato Salad. In an issue of Cooks Illustrated they did what they do so well, the reinvented classic American potato salad. What they found along the way was that the russet potato actually absorbs flavors from the dressing better than other types of potatoes, enhancing the overall flavor of the salad. Try our tasty potato salad recipes above and use russet potatoes for the best flavor!